To follow up from the last post, the following morning we called on Ruben and true to his word, he had welded up all the bits for us, it wasn't free, but it was as cheap as chips, so no complaints. From there we went on to San Juan, the idea being to get another alarm fob for the car, and if possible, to have the alarm reset, when we bought the car, it only came with one key, and one alarm fob, so it has always been in the back of our minds that we might get up one morning, to find the car gone! However, it turned out they couldn't reset it, and a new alarm system was only double the price of one alarm fob, so I had a new system installed. We have now found out which Health Service Provider we are being transferred to, and there are no complaints at this stage, they also have the preferential plan, so I am signing up for that, it is only a smidgen dearer than I was already paying, so I shouldn't notice any difference, I am not sure where we have to go to see a Doctor, but I'll sort that out before the end of the month. Sunday morning, Marcela, Maria Elena, Pépe, and I went up to the finca, the trailer loaded to the gunnels, with the rest of my 'workshop' and cartons of clothes. There was no one there, we parked up, at which I ran into a neighbour, I hadn't previously met, his finca is accessed by a track alongside our property, I introduced myself, and Marcela, and his name is Alejandro, seemed a nice enough bloke, welcoming us to the area. We met another neighbour, Conrado, he was concerned that the bags of old building material on the road side were just going to be dumped, and we would disappear. We explained that we would be moving in shortly, and the rubbish was only a temporary eyesore, whilst work was done to build my workshop, this went down well, not only because the rubbish would be going, but because for some reason, they thought we were having a second swimming pool built. Conrado, seems to be a genuine bloke, he is definitely someone we could go to for local advise. he works on properties in the area, and ended up chatting with Marcela for ages, and advising her on worries we had about things in the garden. Whilst John and Co. were not there, we mooched, and Marcela found that a wardrobe had gone missing from upstairs, it was one I was going to renovate for one of the visitors bedrooms, I also found that Ramillo had helped himself to my new gas bottle, as the old one had run out. It was like putting a light to the touch paper, I went ballistic, Marcela rang John, who said I had said they could clear out the house, and take what they wanted... Lying B@@@@@@!!! Marcela suggested, that maybe it was just a misunderstanding, and came down to a communication problem, but I knew what I had said they could take, and that certainly didn't include everything. I couldn't calm myself down, it was a good job John wasn't on site, otherwise I would have ordered him off. I continued to organise my temporary workshop in one of the downstairs bedrooms, at least this time, I have the whole bedroom! Whilst I was doing that, Marcela and Maria Elena unpacked all the cartons putting the contents into black sacks, so we could take the cartons back and refill them. Once we had finished, we set off for home. I guess that by bedtime I had calmed down enough that I could sleep, but I wasn't happy. This morning, I text John to say that I was not happy with his explanation, however to avoid further problems in communication, nothing was to be removed from Site in future without him talking to Marcela. Shortly afterwards, he replied to say he didn't understand, but was nearby and would call at the apartment, which he did. He has arranged the return of the wardrobe, and apologised, I met him halfway, because he has been a good worker, and put it down to cultural differences, what I consider acceptable and what happens here, are totally different, anyway we parted on good terms. We then went up into town to sort out some bills, before heading to San Juan, the new car alarm was playing up, we would set it, walk away and then in the house hear it deactivate itself, on checking, no only had it deactivated, but the doors had opened. On checking it, they agreed it was faulty and replaced it, in a matter of minutes. We went over the road to HomeCenter, bought a new Filter Pump for the swimming pool, and some copper pipe to run a gas line from the new cooker to the Tool shed, where the gas bottles will be stored. Back home, and after lunch, Marcela, Pépe and I, headed off for the finca, Pépe knows now where he is going, and loves it. At the finca, I unloaded the car, and then Marcela headed off to do some Town Hall work, in Copacabana, I then started drilling the metal work for the wood supports and posts. Pépe in the mean time, was having a great time running around the garden, my initial fears about the swimming pool have not materialised thankfully, and even if he did fall in there are built in graded steps, so he could get out. I went round again to take a photo or two of the work being done on the neighbours land to install the land drain, they are doing a great job. It still amazes me, that product selection in shops and Building supplies are so limited, you can't go and buy perforated pipe here, you buy the pipe, and then have to sit with a drill and drill thousands of holes along the pipework. John smiles at me now, because he knows, that I know why, I just have trouble accepting it, it keeps people in employment, why make things easy, when by requiring alterations or adapting things, someone is kept in work. I really do find this both crazy and frustrating, it makes life so difficult, and although it does create or retain employment, if the country wants to progress, people are going to have to change their attitudes. 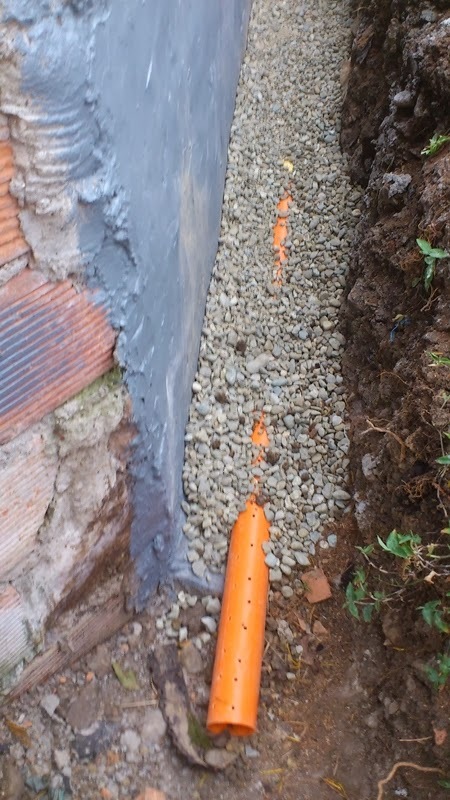 However as you can see, it might have taken longer, but the end result is great, and the house wall has been rendered to above ground level, and then a coat of water proofing paint has been applied. The inside wall is already drying out nicely, so I think we can say, that this is a result! 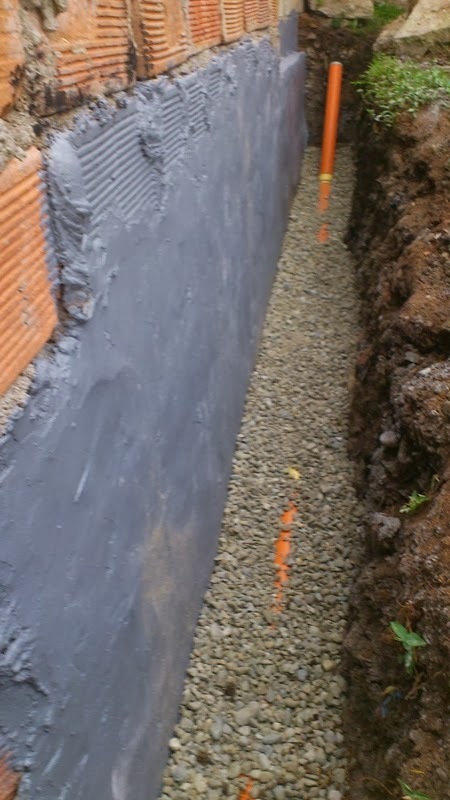 Now I have just got to ensure they backfill properly, and re-instate the neighbours garden, without any complaints. I then went and completed my drilling, as Marcela returned, so she played with Pépe in the garden, when I had finished we headed home, because a storm was brewing, however I think we drove under it, because it had been bucketing down in Bello, but Copacabana was just about to get it, that'll test the work done!